UN Secretary General Kofi Annan has called on Iran to free imprisoned dissident journalist Akbar Ganji. In a letter to Iran's president, Mr Annan demanded Ganji's immediate release "on humanitarian grounds". 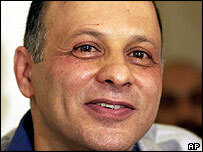 Ganji was jailed in 2000 for a series of reports linking Iranian officials to the murders of dissidents. He began a hunger strike in June, demanding to be freed. Tehran says he resumed eating this week, but his wife says she cannot confirm that. Ganji's action has made him a rallying point for pro-reformists, students and human rights activists, reports the BBC's Pam O'Toole in Tehran. Mr Annan's letter to the newly-elected Iranian President, Mahmoud Ahmadinejad, urges the journalist's "immediate release", a UN official was quoted as saying by the Associated Press news agency. Mr Annan has previously expressed concern about Ganji's situation, but the letter is the strongest action by the world body so far, our correspondent reports. The US and the European Union have also called for the release of the prominent investigative journalist. There has been much uncertainty about Ganji's condition, who was jailed for "acting against national security" and other crimes. He is said to have lost 30kg (66lb) since he started his hunger strike. Some reports have suggested he was in intensive care. However, Tehran's deputy prosecutor said earlier this week that Mr Ganji had ended his hunger strike and announced his readiness to co-operate with his doctors. Ganji's wife told the BBC she was unable to confirm or deny reports about her husband's condition. She said she had not been allowed to see him for 19 days and was trying to get permission to do so.